'Professor' Walter Beaumont was a professional diver, he gave regular diving exhibitions from the pierhead in Llandudno. Born in 1856 in Bromley By Bow, he had already saved 7 lives by the age of 12. He became a professional diver and, whilst on tour, he created the World Record for remaining underwater in a tank - 4 minutes 35 seconds! He settled in Llandudno in 1895, performing diving exhibitions at the Pierhead from 1895 to 1904 (for which he received 'substantial fees'), as well as completing several World tours. One of his specialities was the 'Handcuff Dive', in which he would dive into the water with his hands firmly handcuffed behind his back with Police handcuffs, only to emerge from the water seconds later with his hands free. His 'Fire Dive' was also famous; he would be bundled into a sack that was sprayed with inflammable liquid, set alight and then dive into the sea - an enthralling sight when performed at dusk! From 1895 to 1909, he also gave spectacular underwater displays in a glass sided tank in the Eqyptian Hall (part of the Pier Pavilion building's basement). By May 1903, he had saved over 120 lives and was rewarded by a Banquet given in his honour at the Prince of Wales Hotel by Llandudno Council, who presented him with an Illuminated Scroll and gold watch chain. He was also Licencee of the Kings Head pub from 1898-1910 - unfortunately, he was not a businessman and bankruptcy proceedings were eventually brought against him in 1910 by the brewers Ind Coope. His debts amounted to £596 and the insolvency hearing cannot have come as a surprise, as it was revealed that '"he kept no books or accounts and had been aware of his insolvency for six or seven years"! Mr Beaumont blamed his insolvency on the sickness of himself, his son and daughter. There was much laughter in the Court when he revealed that he indulged in betting on horse-racing occasionally but only only bet large sums 'when the horse told him it was going to win'. His daughter Alice, who joined the act when she was only 6, married Belgian violinist Henri Verbrughen, from the Pier Orchestra. On 16 May 1964, their daughter Gabriel Woodward, of Las Vegas, returned to Llandudno aboard the luxury cruise liner Kungsholm, for a 6 month holiday with her aunt, Maud Deacon at St Margaret's Drive, Craig Y Don, Llandudno. His son, Walter Jones Beaumont, became a well known and successful Criminal Lawyer in Canada, eventually dying in 1960. Walter is buried in St. Tudno's Church, Great Orme, Llandudno. Does anyone have a photo of the man himself that I can add to this post or any further information? Hi, just googled Walters name after seeing his picture on BBC news website regarding Olympics of Llandudno! There is a picture of him there with his wife and son and I was curious to see what happened to him and his family so thank you! This is my great great great grandfather! So nice to see that people appreciate him - I had no idea about him until my grandmother mentioned that water babies run in our family! So amazing. Thank you for this post! This is my great great great grandfather! I had no idea who he was until my Nanna mentioned that water babies run in the family. I am moved and touched by this post, thank you so much! 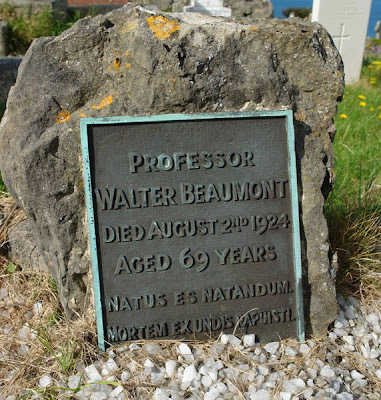 Hi there - how interesting to read more about "Professor" Beaumont. - my grandmother was Maud Deacon of Craig y Don Llandudno. I think the plaque shown is on our family grave at St. Tudno's Church Llandudno. I met Gabriel Woodward briefly many years ago in Chicago. Also Walter Beaumont the lawyer son from Canada on a visit to Uk in 1950's. The Verbrugghen family decendants of the violinist & conductor Henri Verbrugghen and his wife Alice mostly live in North America. I think Alice was my grandmother's sister. My mother Alice Mary nee Deacon used to talk a lot about her childhood in Llandudno and her relative Walter Beaumont diving off the pier & sitting under water in a tank and having a pub and the Ferry Hotel at Tal y Cafn. I had a lovely summer visit to Llandudno this year to visit the family grave and walk the pier!